Cynic, sage, prophet, or Lord - who was Jesus? Christology constitutes the heart of theology, since "to know the nature of God we must see his face in Jesus Christ." This important book is a vital exercise in seeing Jesus faithfully and truthfully. 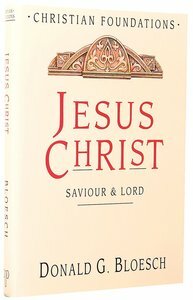 About "Jesus Christ (#04 in Christian Foundations Series)"
Donald G. Bloesch (Ph.D., University of Chicago) is professor of theology emeritus at Dubuque Theological Seminary in Dubuque, Iowa. He has done postdoctoral work at the universities of Oxford, Tubingen and Basel and has written numerous books, including Faith and Its Counterfeits, Christian Foundations Series, Evangelical Theology in Transition, Theological Notebook Volume 3, Essentials of Evangelical Theology, The Future of Evangelical Christianity, The Struggle of Prayer and Freedom for Obedience. He is also a past president of the Midwest Division of the American Theological Society. In Holy Scripture, Donald G. Bloesch sets out the pivotal evangelical doctrines of the Bible's revelation, inspiration and interpretation. Wishing to "defend the orthodox evangelical faith from its friends as well as its enemies," Bloesch provocatively argues against both evangelical rationalism and liberal experientialism. And he proposes the alternative of biblical evangelicalism--which sees Scripture as the written Word of God but stresses that it becomes the living Word of God only through the illumination of the Holy Spirit. In dialogue with Martin Luther, John Calvin, P. T. Forsyth, Karl Barth and Emil Brunner, Bloesch's Holy Scripture examines the implications of biblical authority for the twenty-first century. It surveys the role of the Bible as seen within the Bible itself and as that role has unfolded through centuries of Christian tradition. It also explains and critiques many highly contested issues, such as the value of biblical criticism, the meaning of myth, the plethora of hermeneutical options and the nature of truth.